If you have forgotten your Registration Number, Don’t Worry. The Process is Quick and Simple. Railway Recruitment Board recently announced the latest recruitment for the post of Junior Engineer on its official website. The candidates interested and eligible for the post were able to apply for the examination from 1st January 2019 to 31st January 2019. The candidates will now be able to check their Application Status and check the list of Selected candidates, whose applications have been marked correct for the Recruitment Purpose. To Recover RRB JE Registration Number, Candidates can visit the link provided below and retrieve their Registration ID and Password. To log into the official website to check the Status of Application and download various important documents, the candidate is required to have their ID and Password. The candidates would require their Login ID & Password in order to access the Candidate’s Portal. It is always recommended to keep these details in hand and never lose it. Though if you have Forgotten RRB JE Registration Number or Password, follow these steps and recover registration Number and password. Check your Registered Email ID and Phone Number. Registration Number and Password are shared through the Registered Email ID and Phone Number. Submit the required details like RRB Name, Candidate’s Name, Date of Birth, Father’s Name, Registered Email ID, and security code. Click on the tab after confirming that the provided details are correct. You will receive an automated Email, on your registered Email with Registration Number and link to reset the password. Candidates are advised to not forget these details and in later stages, the link might get disabled. Railway Recruitment Board announced the RRB ALP Result on its official website and the regional website on 2nd November 2018. RRB ALP CBT 2 Exam Dates for all the selected candidates is specified to be between 12th December 2018 to 14th December 2018. To download the RRB ALP Result CBT 1 the candidates can check the RRB ALP Result Login Link and download the provided result and scorecard. 04/01/2019 Latest Update: RPF Lost Registration Number and Password can be recovered now. Check the link to retrieve RPF Registration Number. The RPF Examination for Sub Inspector and Constable post is going to be conducted from 19th December 2018. 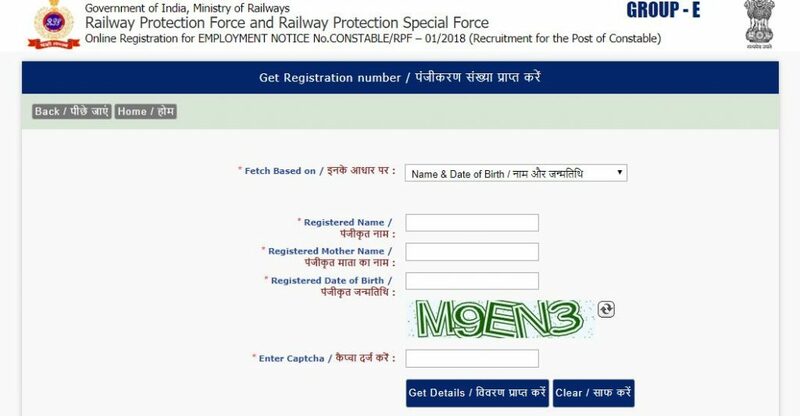 The RPF Admit Card will release on 9th December 2018. The candidates would require the Login Details to download RPF Admit Card. If you have lost your RPF Login Details, check the Printed Confirmation Page of Application Form. The details will be mentioned. Following ways can be taken to recover the lost Registration Number. Check the Valid Phone Number provided earlier at the time of Registration. Confirmation SMS will mention the Registration ID. Check the Registered Email ID for the Confirmation Email from RPF confirming the submission of RPF Application Form. The Email will mention the Registration ID. Check the Printed copy of the RPF Application Form. Registration ID will be mentioned. RPF has not yet provided any link or provision to recover the Registration ID. Candidates are thus advised to keep Login Details safe. In future, if any update for recovery is made, we will provide you with the links and help. The process is very simple. The Candidate’s Roll Number is mentioned on the Scorecard of the RRB ALP CBT 1 Result. Follow the below steps to recover the RRB ALP Roll Number. Click on the link to Retrieve RRB ALP Roll Number available below. Then enter your Registration Number, Date of Birth and Captcha code. Note down your RRB ALP Roll Number and keep it safe for further use. You will be clicked to a new page that is meant for Recovering your RRB ALP Registration ID. Your Retrieved RRB ALP Registration ID will be sent on your registered e-mail ID. Keep your Registration ID safe until the completion of the Recruitment Process. This has been a serious issue that applicants usually forget or misplace their Registration ID after filling the application form. Now, you don’t have to worry about it because the Indian Railways have come up with the solution. Now you can retrieve your Registration ID online in a few clicks. The direct link to recover your Railway Group D Registration Number is given below in this article. 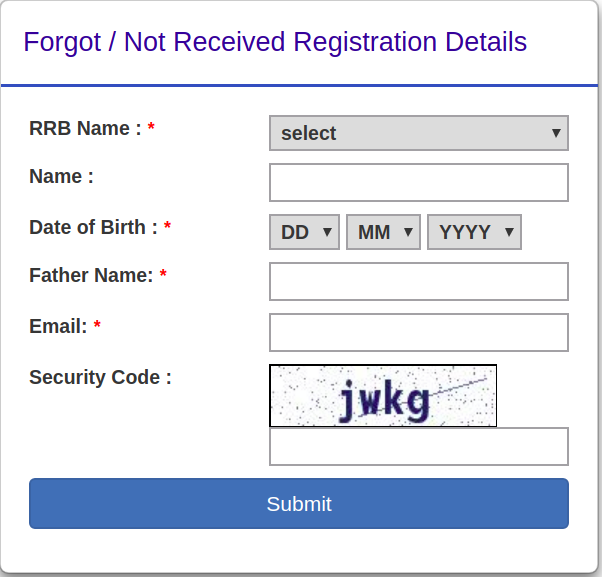 How To Retrieve your Lost/Forgot Registration ID/Number Online? Railway Group D Admit Card – Download Here! If you are unable to recover your RRB Registration number through the link mentioned in this article up. You can also contact with Regional Railway Recruitment Board. 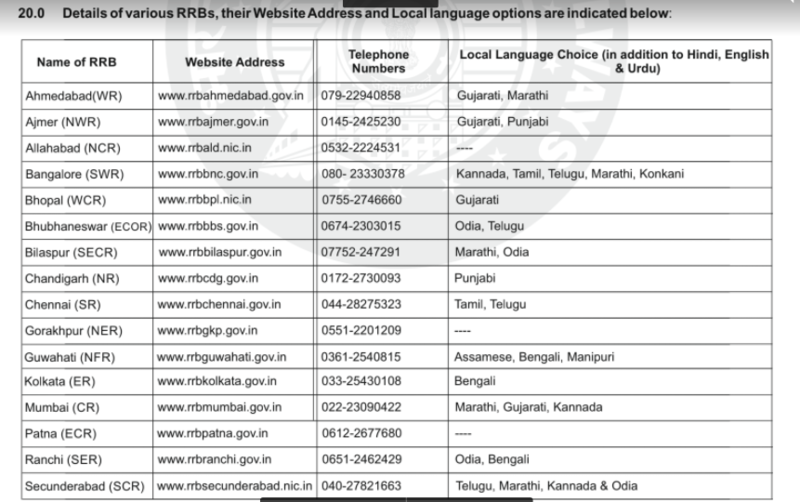 Here, we provided the Contact Number & more details about 21 Regional RRBs. I have applied for RRB JEE CEN 03/2018 unfortunately I forgotten my Registration no. From my computer , Mobile and Gmail due to formatting my system.. So for I am unable to view my application status. i lost my rrb je registration number please help,how can i recover it i want to check form application status. I lost my registration no of JE and above given like is now deactivated so please help me to get my registration no. I am unable to login with my credentials. even unable to recover the password. it is showing the error as the registration no or password is wrong where as I have an email with registration no and password. Even tried to recover but still it is showing the information is wrong. Please help how to login. The link to download the admit card is not available anymore. Though if you are selected in the examination, you can submit the result scorecard as the proof for document verification. I am not able to understand your query. Kindly explain what you have missed in the application form and in which Recruitment are you talking about. I have lost my registration number. tried to recover the same with forgot link but every time error is appearing even if all the details are correct. Please help me with this and let me know if more information is needed. the links are deactivated now. Follow the steps above the link to recover is provided in the article. Tell you Recruitment Exam that you applied for. I guess you have forgotten your Registration Number. You can recover your registration Number from the RPF official website. If you tell me in which Recruitment you applied, I can provide you with the correct Link to Recover lost registration number. Hello sir i lost my RPF registration ID…. how can i recover my registration number…please help me sir…. If you need to recover SI Registration Number visit the link and recover your Registration Number. If you need to recover Constable Registration Number visit the link and recover your Registration Number. The link to retrieve the RRB ALP Registration Number has been deactivated. Kindly check for the Confirmation Mail or SMS to recover your registration number. There is no other way to recover the registration number. Kindly check your confirmation email or SMS as the link to recover your registration is deactivated. The link to recover the registration number is deactivated. Kindly, check your confirmation email and sms for the reference to Registration Number. Heloo sir i lost rrb alp registraion no …thats y i cant see my result ..i m so scared ..becoz i think i qualified 1 st stage exam plz help me …site par koi update ni h raha na h open ho raha h plz help me …. There is no link available for the recovering the RRB ALP Registration Number. Kindly check your emails and Confirmation page of the application. If not available kindly contact RRB. There are no means to retrieve the registration number for ALP right now. Visit the official website of your regional RRB and click on the link of Recover Registration Number. Follow the steps as stated above and recover your Registration Number. Visit the official website and follow the steps explained above to recover your RRB ALP Registration Number. You can recover your registration number simply follow the steps given above. Also, RRB ALP Result is not yet announced. We are expecting the results by the First week of December. Any further updates will be provided. Bookmark the links, and keep visiting regularly. RPF has not yet activated the link to recover the Application Number. As soon as the link is activated we will update it. Sorry to inform, there is no provision to recover RPF Registration Number. In the future, if any provision is made we will inform you. I have lost my RPF CONSTABLE registration number.My name is vignesh Kumar. Plz get it sir i lost it from everything at email, at mobile phone ..
Hi Vignesh, there is no provision to recover Registration Number for RPF applicants. If in future any provisions are made we will inform you. RRB ALP Result is not yet announced, the result announced earlier has been canceled. For your concern, Registration Number and Date of Birth is required to log in the web portal. You can then download the RRB ALP Result. Roll Number will be mentioned on the Result Scorecard. For more details follow the link. Complete information to recover the Registration Number is given above. Previous Admit card cannot be downloaded again. Though Admit Card for CBT 2 Exam will release soon. THen you can download the Admit Card and it will mention your roll number and registration number. I have lost my RPF CONSTABLE registration number.My name is Uday Mori. Check the Printed Application Confirmation page, THe Registration Number will be mentioned. Other than that there is no provision to recover RPF Login details. Check trash files from the mail to find the confirmation mail. In future, if any link or provision is made for the recovery of login details we will update you. Since the ALP Results are Canceled the link is deactivated. Soon when the Results are declared again, you can check the RRB ALP Result and the scorecard will mention your Roll Number too. Sir..I have lost my registration no. I have applies from Gorakhpur zone. Can I please get my registration no? any option to get date of birth,which entered in Group D application. ?.MY DOB is mismatching.Please help me if u can.I want to attend Exam. SR I HAVE LOST MY REGISTRATION NO.HOW CAN I RECOVER IT? Please Provide RRB Region & email id which you had mentioned at the time of Application registration. sir i for got to save my alp form plz tell me how to get it so that i can know my trade what i have selected. we already provided the link to recover rrb group-d registration id. Kindly read the article, and enter correct details. Kindly enter your details correctly and submit. JO DOST APNA RAGISTRATION NO. BHOOL GAYE HAI.YA NAHI KHO GAYA HAI. O JIS COMPUTER SHOP SE FORM FILL KIYE HAI. HUA HAI UNKE PAS SAB RECARD HOTA HAI..
RECARD KE MADYAM SE BHI LE SAKTE HAI. Kindly enter the details correctly. Give your registered e-mail id and check on the RRB Region where you have applied. If you have lost or forgot your Registration ID, then kindly read the article properly. Follow the steps. Mention your details correctly. You have to login yourself to the respective RRB Regional Website where you have applied. The RRB Group D Admit Card will be available from 13th September onwards. Kindly visit the Regional RRB Website where you have applied and submit the details on the Forgot Registration ID Link. You wil recieve your Registration ID on your e-mail id. please visit RRB website to view your exam date and city intimation advice on CBT for level 1 post. but i tried all site but not found ,please help me. Please try it once again. Visit the RRB where you have applied and try it out again. Enter the details correctly. i lost of resitration no. and email id. Read the Article and follow the procedure to retrieve your Registration Number. If still, you are facing issues then you can drop a comment here. If you have lost your Registration Number then you can retrieve your Registration ID easily. Please read the article and follow the steps. You will receive your Registration ID on your registered e-mail id. Sorry Vijay, there is no solution for this. Sir i Lost my registration number and didn’t remember the registerd email ID and number too. Simply follow the steps mentioned in the article. Otherwise provide your details – E-mail ID, Date of Birth and the RRB Region you have applied for. Kindly follow the steps that is mentioned in the article, Mention your E-mail ID and Date of Birth and the RRB Region you have applied for. Please mention your RRB Region. please help me sir im in trouble and really worried for my test. Please Visit the Correct RRB Website and enter the details correctly. 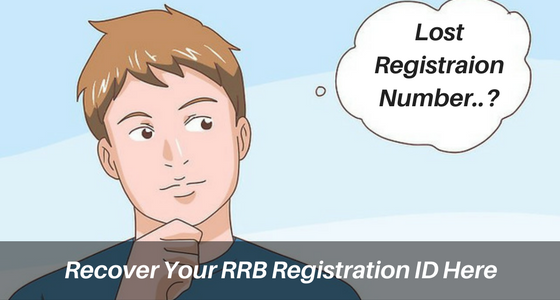 for recover your registration number you must have to Email Id which you have been used at the time of RRB Group D Registration. read the article again. we are already provided the link to recover your rrb group d registration number regional wise. Please Proved the RRB Region name for which you have applied. Sir. I lost my group-D registration ID. How can I get my ID number. Please help me sir. we already mention all t5he process to recover registration number for group d exam. My registration ID Is lost . When i tried to recover my ID it shows to enter my adhar no. pls sir my exam is quikly date so i request sir my regstition no. Resand my email and my cell phone no..
please send RRB Zone/ Region for which you have applied. the link to recover rrb group d registration number will be activated soon. I have 10 digit number which is not acceptable in any site. When I tried retrieve then it show that i have entered wrong detail. Anyone please help me on this. hi Aswani, The steps to recover registration number is already given in the article. read the article carefully. hello sir, I have lost my CEN 02/2018 application form, How to I get back or download through website…please help me. I forget my Register ID, main website in link is available but i entering the Correct details but i am not get the register id. Please resolve the problem as soon as possible. Sir lost my email and registration no of ALP EXAM sir please help me to find out REG. NO. I have lost my ALP registration number can u please help me what i have to do. we have already provided the link in the artice where you can find your registration number. sir plz help me how can i get my registration nymber back cen no.2 .. I forget my registration no with e mail id what should i do ? sir I forget rrcranchi registration number ALP.and also forget my email.so how to get reg.no..
i forget my email id how i can get back my registration id. Sir mene ALP ka status check kia lekin har bar invalid registration bataya. sir i forget the state for which i applied for alp.how could i watch my exam city center. I forget my ALP resitration no. how i recover my resistration no. Sir i lost my rbb alp application id pls help me sir how can i recover..
mera resistration nomber kese recover haga ? I lost my ALP regestration number can u please help me what i have to do. I have lost my registration number of RRB Application.I kindly requesting to you please inform me to way to get My details..
SIR I AM UNABLE TO LOGIN . sir http://www.rly-rect-appn.in this link was not opened. i kindly requested to RRB Recruitment my lost registration number. this link is only for RRB ALP Application. Sir i lost my rbb alp and grp d application id plse help me sir how can i recover..
Sir i just forgot my registration number then i follow the steps to recover my registration number for so much time but steel i did get my registration number therefore sir plz help me. Sir I fill my room before 01/3/2018 and Complete fill the form but print can’t taken out. So please tell me if my form rejected or not?